A wedding date has officially been set and now the planning has begun. For many brides-to-be, finding your wedding dress will be at the top of the list and one of the most important aspects of your special day. With that in mind, it’s no surprise that finding the perfect shoe would be next on your list. Your wedding shoes will be the finishing touch to your look, while comfortably supporting you during your big day. Here are 4 industry-expert tips to consider when choosing the right footwear for your wedding. Your wedding dress and shoes should flow in perfect unison. Although this may seem obvious, it can be easy to overlook. A bride-to-be may lust over a pair of shoes and buy them, only to realize they don’t go with the dress she wants. Here are some questions to consider when buying your shoes: is your wedding dress style vintage, classic, or modern? Is your wedding dress long or short? What color is your wedding dress? Style, height, and color are important factors when deciding on your wedding shoes. If you are wearing a shorter dress, consider choosing a statement wedding shoe, such as this jewel-encrusted LE CHÂTEAU pair. Once you’ve found both your wedding dress and shoes, be sure to wear them together at all your fittings to make sure the hemline is just right. It’s important to consider where your wedding will be held to ensure your shoes fit the environment. If you are planning a beach wedding, a slim stiletto may not be the best option, but that doesn’t mean style has to be compromised. If you are planning a traditional church wedding but still want a bit of pizazz, go for a white pair with some sparkle such as this subtle option or this bolder option. The words modern, trendy, and sleek come to mind when we think of a hotel or banquet hall wedding. When it comes to wedding shoes, these graphic d'Orsay sandals are a perfect match for the setting. For a garden wedding, a block heel, in a jewel or pearl embellishment, will look just as amazing as a higher heel while keeping you from sinking into the grass. A rustic barn wedding is nothing short of romantic, and a pair of jeweled ankle strap heels is definitely swoon-worthy. 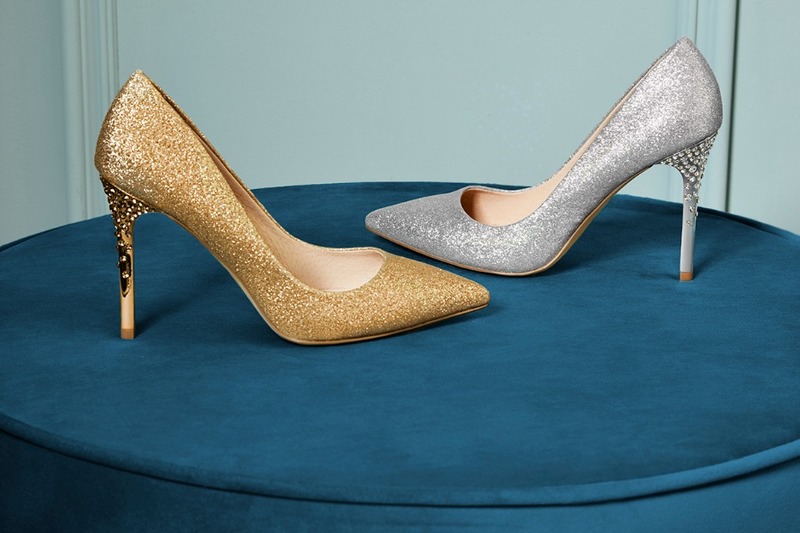 We adore this jewel-encrusted option and this satin pair. If you are planning a destination wedding, we love these flat jeweled sandals. Super sweet and sand-friendly! It may not be as fun as looking at pretty dresses, but taking the time to organize your wedding budget will help eliminate panic in the long run. Knowing exactly how much is allocated for your wedding shoes will allow you to search within that budget, stress-free. 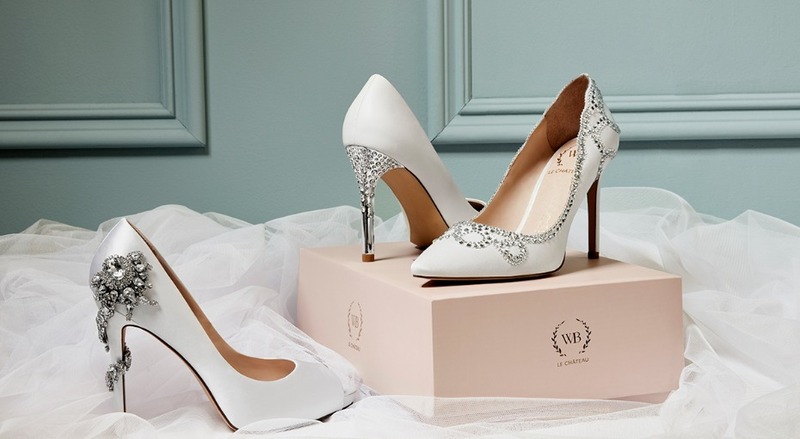 Wedding costs add up, so it’s nice to know that there are wedding shoes that are equally beautiful and at a good price point. From the actual ceremony to your first dance to making the thank-you rounds during the reception, you will be on your feet a lot. There will be nothing worse than getting a painful blister on your big day, so make sure you can comfortably walk in your shoes beforehand. Look for shoes that have a leather insole and lining to ensure maximum comfort. If you aren’t used to wearing heels, try a pair with an ankle strap for added support or have a second, flat pair on hand for the reception. Be sure to check out LE CHÂTEAU’s new WB shoe collection here.